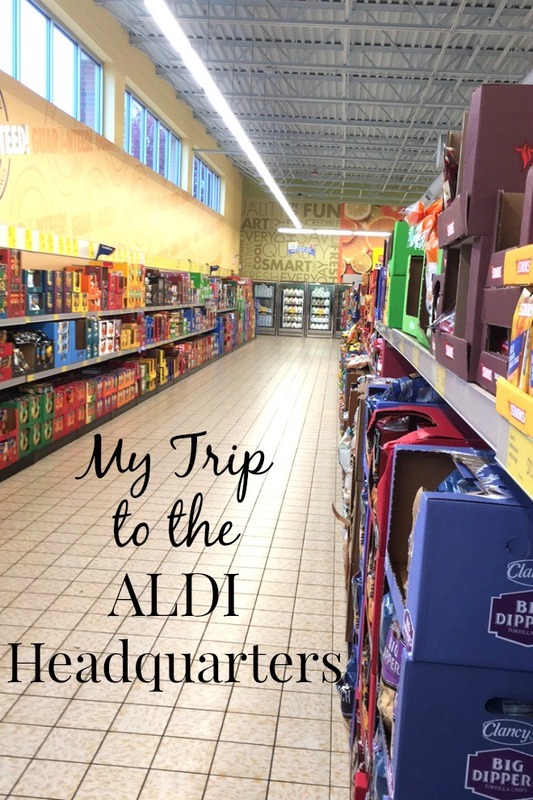 Thank you so much to my friends at ALDI for the amazing trip to your headquarters and for sponsoring this post! Since I've talked about it probably twenty times on the blog before, you all know how much I love ALDI. I have been shopping at ALDI for at least 7 years and it is my favorite grocery store. I shop there at least weekly and it has saved me so much money. I used to coupon a ton which also saved money but it took so much time. I love being able to walk into ALDI and save money without coupons or having to wait for sales. When I got the email a couple of months ago inviting me to an ALDI press trip, you know I was so excited and immediately had to say yes. ALDI flew a bunch of dietitians and I out to Chicago to tour their store and sample a bunch of their products. After seeing some of the "inside information" about ALDI, I can tell you that I love it more than ever and will continue to do at least 70% of my shopping there. ***Keep reading for a $100 ALDI giveaway! The trip started with a store tour. I learned a bit of new information but to be honest, whenever I see articles about ALDI, I read them right away so I knew a lot of the ways that ALDI is able to keep their prices low. A few of the ways: you have to bag your own groceries so it saves time on labor, the food is put on the shelves in boxes to save on labor, you have to put a quarter in your shopping cart which you get back when you return it, etc. · -Their stores are about 10,000 square feet compared to 40,000-60,000 square feet like many other stores. · - Many of their products are actually made by manufacturers of national brands. · - Their wines have won awards and are made by top US and international manufacturers. · - Something interesting is that each package has multiple UPCs to make checkout even faster. We have no products from ALDI that we dislike and some of our favorites are: Friendly Farms Plain Nonfat Greek Yogurt, eggs, milk, SimplyNature Organic Baby Spinach, Clancy's Kettle Chips, Casa Mamita salsa, Tuscan Garden Jalapeño Slices, Fit & Active No Salt Petite Diced Tomatoes, SimplyNature canned beans, Fit & Active® 2% Milk Sharp Cheddar Cheese, etc. We get most of our groceries from ALDI so it is hard to pinpoint favorite items because there are so many that we love! After our store tour, we went to the ALDI headquarters where we played a fun game called "ALDI or Not" where we tried two identical looking products and guessed which ones were ALDI brand and which were a national brand. I got all but two right! The big surprise to the group was the vegetable chips which everyone liked the ALDI brand better and we all guessed wrong. I will definitely be buying more of these chips! Then, we tried some recipes made with all ALDI ingredients. I loved the smoothies and parfaits. We learned about ALDI and now they work with a team of dietitians and a corporate in-house dietitian to make sure their products are healthy. ALDI is constantly changing their products to what the consumer wants. Consumers wanted more gluten-free products so ALDI made them. They wanted no artificial colors, added trans fats, etc. so they took them out. I love shopping at ALDI because I know that they have such a variety of healthy products that my family loves at such an affordable price. We then got to sample a bunch of cheese plates with dried fruit, nuts, olives, meats, strawberries and more. I loved this! ALDI did not forget any details on this beautiful press trip. ALDI cares a lot about what their customers think and they work closely with food manufacturers to make changes to their products as needed. They also have a team of Quality Assurance professionals and Test Kitchen chefs making sure products taste the best they can. We got to watch a cooking demonstration from Chef Brigitte Prather for a delicious kale salad with lemon yogurt dressing. Then, we went into another room where we learned about how to create better videos. I don't know if you know this about me but I am terrified of creating videos. It is not because I do not think that I could create a good video but because I am scared of going in front of a camera. Luckily, the other RDs were really nice to me and encouraged me to help out with the part where you see your hands and the food but do not have to talk. I did better than I thought!! Maybe one day I will start creating videos! Then we had the most delicious dinner before we left. I really enjoyed the butternut squash and cranberry chicken meatloaf with mustard sauce which was full of flavor. I would make this at home! The trip to ALDI was amazing and I will continue to shop there to feed my family! We are able to save so much money and still get healthy groceries. I learned that you can save up to 50% by shopping at ALDI (depending on which products you buy). The giveaway will be for a $100 gift certificate to ALDI!! I like shopping for can goods at Aldi. The Aldi's meat prices are fantastic, especially poultry, got a Turkey for Thanksgiving for a great bargain as well. Amanda, you should totally do videos...You show photos of yourself on the site so it's a little stretch to do a video. Maybe create an elite group to view the videos so you can get feedback and/or to give you confidence to release to all your followers? I love ALDI and shop it at least once a week and I love all the fresh fruits and veggies! We do shop there. We love their produce! I just started shopping there a month ago when they became more organic and free of certain chemicals in their foods. I really love their prices. We FINALLY got ALDI's in California this year, and I am so happy! Love the produce, gourmet cheese selections and fantastic prices on organic items. Oh, and my Dad really likes the chocolates. I shop Aldi often. We really enjoy the fruit and vegetables selection. I love shopping at Aldi! My favorite things to get include specialty cheese and produce. I have not gotten to shop there yet, since there haven't been any in our area, but they just opened one up nearby and I can't wait to go and see what they have! I like their fresh fruit and vegetables. I love Aldi. My favorite items are their dairy products. They always have hormone-free items and really yummy cheeses! At the BEST prices. I love everything! The have such great price on their canned foods, milk, egfs, and more! They have great prices on veggies! I haven't shopped there! Hope to shop there soon though! I shop at ALDIS roughtly once every three months. I like to go there for their heavy whipping cream and minced garlic. It's so much cheaper than anywhere else. Thanks. Aldi shopper and we love their cereals, eggs, milk and ice cream! First time I've been to Aldi's I was shocked to see how affordable everything was! My favorite things to buy there are fruits and vegetables. I've heard about Aldi but I haven't made it there yet. I do not currently shop at Aldi. I do look at the ads and I think their produce are usually a good deal. I love shopping at Aldis I have a family 6 and Aldis prices fit right into our budget! Our favorite item is their frozen pizzas! We pass Aldi when we go to the ortho, but never been there. Heard they have awesome deals. I don't shop there often because there isn't one near my home. I shop at Aldi seasonally, like getting baking powder, baking soda, sugars, etc., are always the best deal! Yes I shop at Aldi every week, it is my favorite store and my favorite items are the Fit & Active brand. I like their fit and trim protein bars. Yes, I shop at Aldis and I like their cheeses. Yes, I do shop Aldis And I like their fresh fruit and vegetables and their fresh meat and the specials they have on different products. I love ALDI and shop there at least once a week. I love all the fresh fruits and veggies they offer. I do shop at aldi and usually I buy milk because it's the cheapest in my town there. I've heard of Aldi but haven't shopped there yet. I have not been to Aldi's yet. One just recently opened up in my town and I haven't had time to try it. We do shop at Aldi's a little. The thing I love the most is their fruit and vegetables. They are fresh with a great taste and usually less than 50% of the cost than at our local grocery store. I do shop Aldi. I love the produce. I have never shopped at ALDI's, however I noticed there is one that is about 1- 1/2 hrs. from here. Hopefully we can give it a try, soon! The Aldi stores in the area are more than 30 miles away; my preferred local store is 8. I have shopped in them occasionally when I am in Tulsa for some other reason, and they are OK, but not worth making extra trips to use them. I do on occasion shop at Aldi. I love their fresh produce! I used to shop Aldi a while ago. I have not been there for a long time. I did hear a lot of great things about Aldi though! I have never been to ALDI but they have one close to me and i would love to try it soon. I have never shopped there, but the veggies look good.